He is a prince, heir to a kingdom threatened on all sides, possessor of the animal magic, which is forbidden by death in the land he’ll rule. She is a princess from a rival kingdom, the daughter her father never wanted, isolated from true human friendship but inseparable from her hound. Though they think they have little in common, each possesses a secret that must be hidden at all costs. Proud, stubborn, bound to marry for the good of their kingdoms, this prince and princess will steal your heart, but will they fall in love? First, the cover . . . I love it! 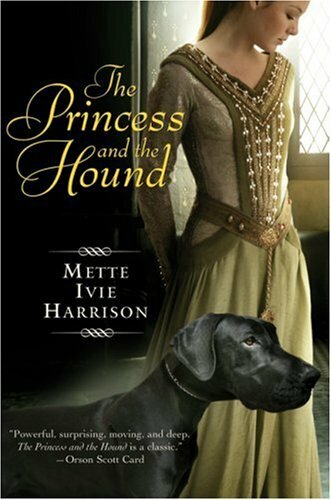 Maybe it’s because I love dogs, but I think the beautifully dressed princess and gorgeous hound make a striking pair. I enjoyed this book. I was frustrated with the mystery for the first half. I’m just impatient and want to know if my hunches are correct. The first few chapters were also slow for me since they told the story of the prince from the age of 3 to 17. Showing the prince’s background really did add to the story though. It helped me know where Prince George was coming from and why he made some of his decisions. The characters were flawed which made them likeable. I was rooting for them and hoping they would find their way to a happy ending. This book is full of magic, insecurity, heart-ache, triumph, and love. I look forward to reading the next 2 books in this series. I have this one waiting on my shelf. I didn't realize it was part of a series, though! I sent you an email, but I'm not sure it went through. You won the giveaway at my blog, so you get to pick any 3 books from the list. (I'm adding The Lost Queen by Frewin Jones to the list if that is one you are interested in).